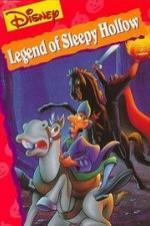 Buy or Rent The Legend of Sleepy Hollow (1949) Movie DVD & BluRay Online! Movie Plot: In a small town named Sleepy Hollow, a gangly schoolteacher named Icabod Crane comes to town. Despite his unattractive appearance, he quickly proves to be a ladies man who charms the local beauty, much to the local tough, Brom Bones’, displeasure. A subtle rivalry erupts, only to have Crane continually gaining the upper hand. The situation changes when Brom learns of Crane’s superstitions and exploits them as he musically tells the legend of the fearsome Headless Horseman to frighten the teacher. That night, Crane’s lonely night ride home becomes more lively than he ever imagined as the Horseman appears to chase him.